In the course of the criminal proceedings implementation with regards to the materials of the officers from the Operational Units of the Western Regional Office, the car with four citizens of Bangladesh was detected in the outskirts of the village Knyahynya. Together with the foreigners there was also a detention of our country fellow who tried to transport the foreigners illegally from Ukraine to Slovakia. During further search actions the law enforcement authorities detained two more illegal immigrants, previously established as the citizens of Ghana. They were found near the village Domashyn, Velukyi Bereznyi district. As it was explained later by the foreigners, they were dropped out of the car and pointed out the direction to the border. Currently, other persons are still looked for, who may be involved in the delivery of illegal migrants to the border. Once the identity of the detainees has been established, they will be held accountable for their attempt to violate the state border. 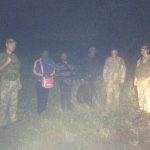 This entry was posted in Translated Media-News from Ukraine and tagged Ghana, state border, Ukraine, v on October 18, 2018 by oksana. The state border service officers detained 8 illegal migrants near the state border of Ukraine. The special alarm system went off and the military staff of the BU “Uzhhorod”, Chop Detachment stopped and detained the foreigners 200 meters before the state border. According to the word of the detainees, they were the citizens of Pakistan and intended to get into the EU beyound the checkpoints. 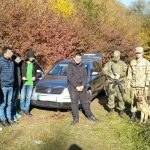 And the border guards of the DU “Rava-Ruska” and “Ambukiv”, Lviv Detachment detained four citizens of the Dominican Republic, Bangladesh and Tajikistan after receiving information from the local residents. All men were unable to show any documents to the law enforcers. Another “seeker of a better life” from Afghanistan was detained by the servicemen of the BU “Shehyni”, Mostyska Detachment. The offender had his internal passport. All illegal migrants were taken to the border units to clarify the circumstances of their offences and the prepare administrative documents. The filtration events are continued. This entry was posted in Translated Media-News from Ukraine and tagged Bangladesh, Dominican Republic, EU, state border, Tajikistan on October 12, 2018 by oksana. Another “seekers of better life” were detained last night by the border guards of Border Unit “Uzhhorod”, Chop Detachment. The residents of the village Onokivtsi, Uzhhorod district informed the officers about the movement of unknown persons near the state border. Three Azerbaijani and one citizen of Bangladesh intended to cross the border beyond the checkpoints to get to Slovakia. Only one of the offenders had identifying document. However, all four foreigners confessed their intention to get to the EU with the purpose of illegal migration. Currently, the border guards find out all circumstances of the crime and establish a circle of involved persons. The foreigners will be brought to the administrative responsibility under Part 2 Article 204-1 of AICU “Illegal cross or attempt to cross illegally the state border of Ukraine”. This entry was posted in Translated Media-News from Ukraine and tagged Azerbaijan, Bangladesh, citizen, Slovakia, state border, Uzhhorod on September 6, 2018 by oksana. In the evening borer detail of the Border Unit “Smilnytsya” noticed the motion of a group of unknown persons 50 m before the border. the law enforcers started searches of possible offenders and soon they detained two foreigners – citizens of Turkey and Azerbaijan. At dawn, the border guards found one more Azerbaijani. It was established that all foreigners arrived to Ukraine in legal way in the end of August by sea, however, they wished to continue their trip to the EU countries illegally. They are threatened with a fine for the sum of 8500 to 13600 UAH or administrative arrest for the term of ten to fifteen days for attempt to cross the state border of Ukraine. This entry was posted in Translated Media-News from Ukraine and tagged administrative arrest, Azerbaijan, citizen, Poland, state border, Turkey, Ukraine on September 4, 2018 by oksana. Four unknown persons, who tried to overcome the barrage fence of the state border, were noticed by the border guards of Mobile Group “Mostyska”. The response team of the BD “Smilnica” apprehended the foreigners 500 meters before the border. The men aged 18 to 40 had passport documents of the Turkish citizens. Also, it was established that the foreigners arrived to the territory of Ukraine in legal way. Currently, the offenders are held in the special premise of the BD “Smilnytsya”, where the circumstances of their illegal trip are being established. The detainees will have to bear administrative responsibility for their attempt to cross the state border. This entry was posted in Translated Media-News from Ukraine and tagged border guards, citizens, passport, state border, Turkish, Ukraine on August 14, 2018 by oksana. Border guards of Lviv Detachment detained a foreigner during his attempt to cross illegally the state border of Ukraine. The border guards of BD “Rava Ruska”, due to the information received in advance from the district inspector, revealed and detained the citizen of Turkey. The man intended to avoid the check point and get to the EU countries. Currentle, the 30-year-old foreigner stay in the border subdivision, where the circumstance of the offence are established. This entry was posted in Translated Media-News from Ukraine and tagged EU, illegal, Lviv, state border, Turkey, Ukraine on August 11, 2018 by oksana. In the course of the border guards’ service the signs of human presence were noticed near the state border. The step track pointed to the fact that recently a group of persons walked this way. 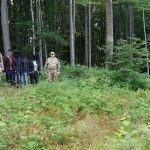 The staff of the SBGSU immediately began the search operations and informed the representatives of the border police of Slovak Republic. 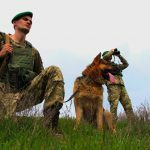 In order to improve the efficiency of the search and prevent offences, the Ukrainian border guards initiated the joint patrolling with the European colleagues. Soon, the joint detail detained four Asians. They were just on their way to Slovakia and tried to cross the border. Eight more illegal immigrants were apprehended by the Slovakian law enforcers close the firts group immediately after the violation. Detainees had no documents, and introduced themselves as the citizens of Vietnam. Currently, the appropriate procedural events take place, the persons are identified, in action of which they shall be liable under the Part 2 Article 204-1 CUAO “Illegal cross or attempt of illegal cross of the state border of Ukraine”. In addition, the persons who could assist the foreigners in their illegal trip are established. This entry was posted in Translated Media-News from Ukraine and tagged Asian, cross, Slovak Republic, Slovakia, state border, Vietnam on July 21, 2018 by oksana. The staff of BD “Nyzhankovychi”, Ukrainian-Polish border, detained three Iraqi citizens without documents. The law enforcers revealed the officers due to the available information received from local residents. As it was established the citizens arrived to Ukraine legally, but aimed to continue the journey to Europe in illegal way. The decision in the case concerning the attempts to cross illegally the state border of Ukraine will be made in the court. Also at the checkpoint “Krakovets” during the border control the border guards detained the foreigner personating himself as another citizen. During the documents verification of the passengers from the minibus the inspector’s attention has been attracted by the passport of the Turkish citizen. The law enforcer established the significant differences in the man’s appearance and image in the document. Soon, the man confirmed that this passport document did not belong to him. Now, the man will have to answer before court for his attempt to cross illegally the border of Ukraine. This entry was posted in Translated Media-News from Ukraine and tagged border, citizen, control, Iraq, law enforcer, state border, Ukraine on July 16, 2018 by oksana. As it is reported by the border guards, the foreigner planned to cross illegal the Ukrainian-Slovakian border. 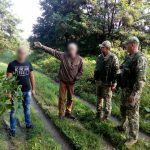 The foreigner, who tried to cross illegally the Ukrainian-Slovak border, was detained yesterday morning by the officers of the Chop Detachment. The offender was found by the border guards of BD “Uzhhorod” during patrolling. The foreigner tried to overcome a line of engineer constructions. The man was unable to provide any documents and claimed to be Syrian. Subsequently, the officer managed to establish that he was actually a citizen of Egypt. Upon performing necessary procedural steps the illegal migrants were taken to the border unit. After their identification, the offender will be brought to administrative liability under the Part 1 Article 204-1 AICU “Illegal cross or attempt to cross illegally the state border of Ukraine”. This entry was posted in Translated Media-News from Ukraine and tagged Egypt, migrant, offender, state border, Syrian on July 13, 2018 by oksana.